The fact that Bilge Ebiri of the Village Voice is the only one truly screaming to the heavens about MY HAPPY FAMILY confuses the hell out of me. Why is such a good film being ignored by the company that is releasing it? More to the point why is a film as solid as it is not being screened in New York and Los Angeles for awards consideration? This is a film that for better or worse should be in the awards mix. 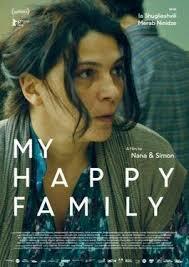 MY HAPPY FAMILY is the story of Manana who at the age of 52 decides to move out of her multigenerational home and live on her own. She is tied of having to put on the happy face and to bend to the whims of everyone else. It’s a move that sends quiet shockwaves through the family. There is more to the story but that should be enough to get you to turn it on. Where to begin? I want to simply say that everything in this film is wonderful but if I had to pick one thing it would simply to say that this film is achingly real. Unless you live your life completely unattached from the rest of humanity this is a film that you will relate to. We all have families and we all submerge some or all of ourselves in order to make the ones we love happy. We all do it. Watching Manana switch masks from pained unhappiness at the situation to jovial hostess and back again moves us. The birthday scene where the gloomy Manana is in formed that guests might be stopping by to celebrate, something she wants no part of is dead on. I, for one, have been there, as she puts on a smile and is welcoming to everyone only to collapse from the effort of forcing niceness when it was done. We all have been there and we relate to her suffering. The film doesn’t just bleed off the screen so much as infects the world around it. Watching the film the other night I felt the room I was in merging with the one on screen. I had a sense that if I went through the door to get a drink I might bump into someone in the kitchen. And there are the other moments that break our hearts or inform us with a grand wisdom, from the reunion to the bracing moment where Manana’s student tells her that if she decides to go for what she wants in life she has to commit to it fully or else be seen as weak and become a prisoner. This is a great film-- which begs the question why isn’t Netflix pushing it? I’m not certain. I’m never certain about what Netflix is doing with their PR since they often seem intent on not getting word out on any film. I would think it’s because the film isn’t in English and isn’t from a country that they know how to market. I mean it’s a family drama from Georgia not a Korean thriller or Bollywood epic. If you have Netflix this should be on your list of films to see, if you don’t you should be bringing food and drinks to a friend who does and forcing them to watch the film.